The Tango 1500T Packaged Mud Recycling System (1,500 gpm capability). Although the use of drilling fluids within the HDD/trenchless industry is still relatively new, recent trends suggest that this standard is shifting as solids control is one of the most important phases in the drilling process. This shift is due to a growing awareness that drilling fluid maintenance and disposal can become exponential problems as they are both harmful to the environment and extremely costly. With the correct solids control system, fluid life can be doubled, if not tripled. Since whole mud dumping and dilution are unacceptable from both a cost and environmental standpoint, effective solids control equipment has become an increasingly important aspect in any drilling process. Often good solids control practices are ignored simply because they are not understood. 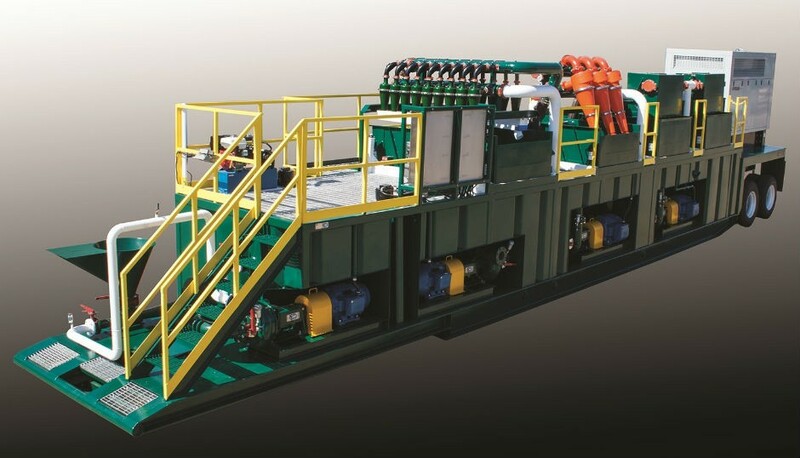 Typically, an HDD solids control system will employ a combination of shaker, hydrocyclone, mixing, pump, and compartmentalized tank technologies. The shaker is vital to the solids control system and is considered the “first line of defense”. Shakers act by removing solids from drilling fluid as the mud passes over the surface of a vibrating screen. Particles smaller than the openings in the screen pass through the holes of the screen along with the liquid phase of the mud. Particles too large to pass through the screen are thereby separated from the mud for disposal. Without proper screening of the drilling fluid during this initial removal step, downstream equipment will experience reduced efficiency and effectiveness. The downstream hydrocyclones and/or centrifuges (if elected) will simply be overloaded beyond their design capacity. Basically, a screen acts as a guard to determine whether a particle is small enough to pass through a screen or not. Screening surfaces used in solids control equipment are generally made of multilayered woven wire screen cloth. The screening surfaces are considered the centre of the shaker, therefore, the quality of the shaker is thus defined by the quality of screens it utilizes. Relative to the use of shaker screens, it is the size of the screen openings, not the mesh count, that determines the size of the particles separated by the screen. It is because of this fact that HDD system users should compare and specify screens based on their API 13C designation. Hydrocyclones are simple mechanical devices that do not contain moving parts and are designed to speed up the settling process. Feed pressure is transformed into centrifugal force inside the cone to accelerate particle settling in accordance with Stoke’s law. Drilling mud enters the cyclone under pressure from a centrifugal pump. The velocity of the mud then causes the particles to rotate rapidly within the main chamber of the cone (such as a tornado in a bottle). Light, fine solids and the liquid phase of the mud spiral inward and upward for discharge through the liquid outlet. Heavy, coarse solids tend to spiral outward and downward for discharge through the solids outlet or underflow. Hydrocyclones are important in a solids control system because of their ability to efficiently remove particles smaller than the finest mesh screens. Centrifuges are another essential part of any effective solids control system. They have a great advantage of achieving extremely fine cut points. The rotating speed is transformed into centrifugal force inside the rotating assembly to accelerate particle settling in accordance with Stoke’s law. Essentially, a centrifuge acts as a small settling pit which alloys rapid settling of solids under controlled conditions. In order to achieve effective solids control there are several steps that should be taken. The first and most critical step is to obtain an effective, dependable, and durable solids control system. Special attention should be given to ensure that the system is hydraulically balanced, capable of making both a scalp cut and a fine cut, and that the system has sufficient drilling fluid mixing and re-circulating capacity. Shake shakers and other solids control equipment should never be bypassed while drilling. The smallest mesh size possible should be used on the shale shaker as this will allow change from formation to formation and will require operators to maintain a variety of screens to be kept on hand. Furthermore, an adequate inventory of recommended spare parts and screens should always be kept to enhance operations. The Tango 200S Packaged Mud Recycling System (200 gpm capability). A good solids control system is only effective when you certify and assign rig personnel to be responsible for equipment operation and maintenance. By employing each of these steps, operators can achieve enhanced rig performance, improved rates of penetration, reduced waste disposal costs, and reduced mud costs. Founded in 1990, KEMTRON has evolved to become an industry leader in reliable, durable, and fully integrated solids management systems for the HDD industry. Operating on a global level with sales and service worldwide, KEMTRON can help you meet your drilling objectives.